New Directions Publishing Corporation, 9780811216951, 245pp. Goethe, Nietzsche, Schopenhauer, Kierkegaard, Wittgenstein, Tolstoy, Einstein--all praised the writings of Georg Christoph Lichtenberg (1742-1799), a mathematician, physicist and astronomer by profession, and an aphorist and satirist on the sly. 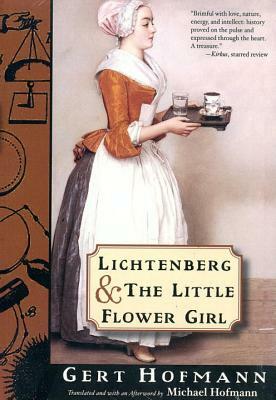 In "Lichtenberg and the Little Flower Girl," novelist Gert Hofmann weaves a wondrous fictionalized tale of Lichtenberg's real-life romance with "the model of beauty and sweetness," Maria Stechard, a flower seller he meets one day near his laboratory in Gottingen. "The greater part of what I commit to paper is untrue, and the best of it is nonsense " says Lichtenberg, our hunchbacked hero. His daily life of "wrestling with death," of electricity machines and exploding gases, is plunged into new passion the day he encounters the Stechardess: "Something is found that was lost for a long time." Soon he teaches her to read and write, she helps him keep house... and then? Colored with Lichtenberg's boisterous, enlightening meditations on life, death and everything in-between, this stunning fable-of-awakening was described by the "Washington Post" as "a quiet and convincing description of human happiness... a fine and original book.